Now is one of the most popular times for people to undergo bigger procedures like liposuction or a breast augmentation. With all of the time off from work, cold weather keeping you inside, and the desire to start the New Year differently, winter is definitely a convenient time to finally go for that cosmetic procedure that you have been wanting. For those of you who chose to kick off 2014 with liposuction for a healthier, slimmer body, this is your guide to your best recovery. How will you feel right after surgery? Well, it is surgery. Slight discomfort and a bit of soreness is completely normal and should be expected. Make sure that you have a loved one there with you after your procedure to drive you home. It is never a good idea to drive while on pain medication. You will also need to wear a compression garment around your surgical site to help with initial healing and to minimize swelling. Now is your time to rest. Throw on your comfy clothes, switch on Netflix, and catch up on all of those TV shows that you haven’t had time to watch. If you’re like me and missed out on the whole Breaking Bad craze, there are five seasons of 45-minute episodes that you can knock out while recovering. Maybe even try to watch some Walking Dead. It will be a few days before you will be able to return to work and it is too cold outside anyhow. You also should have someone there with you throughout your recovery. At first, you may need help with cooking or other chores, like taking the dog out. You’ll be able to walk almost immediately after surgery, but it will take some time until you are back to full strength. Most are able to go back to usual office work after about three to five days. For those that work jobs that require activity, this may be 10 to 14 days. People are always looking at body contouring procedures like liposuction as an easy way to beat obesity, but that is not the case. After your procedure, it is important to maintain a healthy lifestyle. A big part of liposuction recovery is maintaining your health after the procedure. Live up to that whole be healthy New Year’s Resolution of yours. Regular exercise and a healthy diet are critical for anyone to maintain their body’s health and figure. This year – and every year for that matter – limit the number of wings and snacks that you eat on while watching Bravo. Go for a run around the neighborhood a few times a week and sign up for a gym membership – and actually go. Liposuction helps to you get where you wanted, but it’s up to you to stay there. As long as you do this, the fat will stay away. 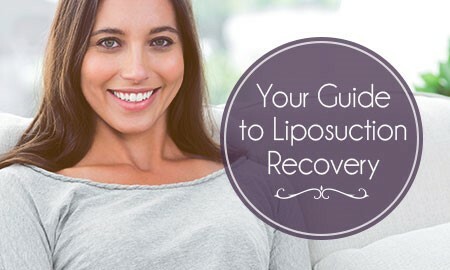 To learn more about how to recover from liposuction contact our team today.